Last month I featured black beans as a favorite budget find. 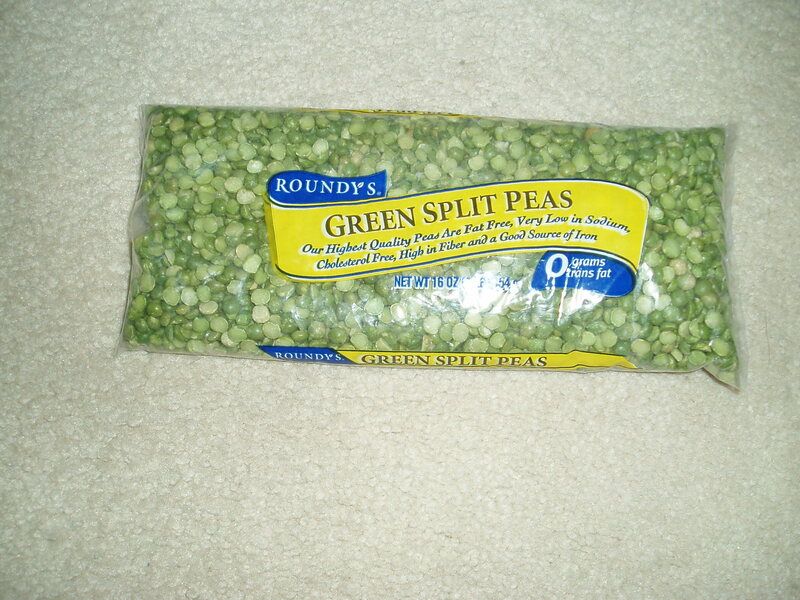 This time it’s split green peas. Like beans, split peas are also a fat free, high in fiber food. And they’re inexpensive…this bag cost just 99 cents. Unlike beans, they need no presoaking. All they require is a wash and rinse to make sure they’re free of dust and the odd small stone that can sometimes creep into the mix. 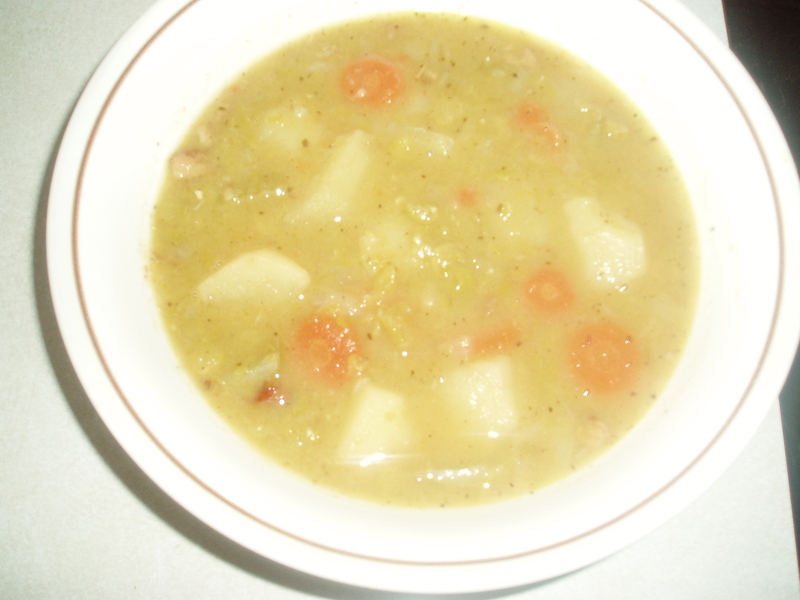 One of my favorite recipes is split pea soup. I had one I’d used for years but it took a long time to cook. Unless I continually monitored it, I was always faced with split peas and potatoes that got stuck to the bottom of the pan. The soup was sometimes ruined and clean up, a nightmare. Lately I’ve been relying on on my slow cooker when it’s time to make any type of soup. So I thought about ways I could convert this recipe. If you’ve ever read tips on how to do that, everyone seems to recommend that you cut the liquid in half but I found for split peas it doesn’t work. They expand and soak up the liquid quickly, even in a slow cooker. I also found that the vegetables didn’t have as much flavor as the old method. So with some trial and error, I decided to saute the veggies with the spices and then add them to the slow cooker. The old recipe also used sage and as I was out of my supply from the garden, I switched to poultry seasoning which is perfect. When you’re cooking this soup you’ll think of the Holiday season and stuffing. So here’s my new version of the split pea soup, slow cooker style. It serves 10-12 and freezes very well. 2 slices of bacon, chopped (optional and this recipe is just as good without, bacon just adds a little smoke flavoring). Wash the peas, add to the slow cooker and add the water, bay leaves, salt and mustard. Turn the cooker on low while you’re preparing the vegetables. 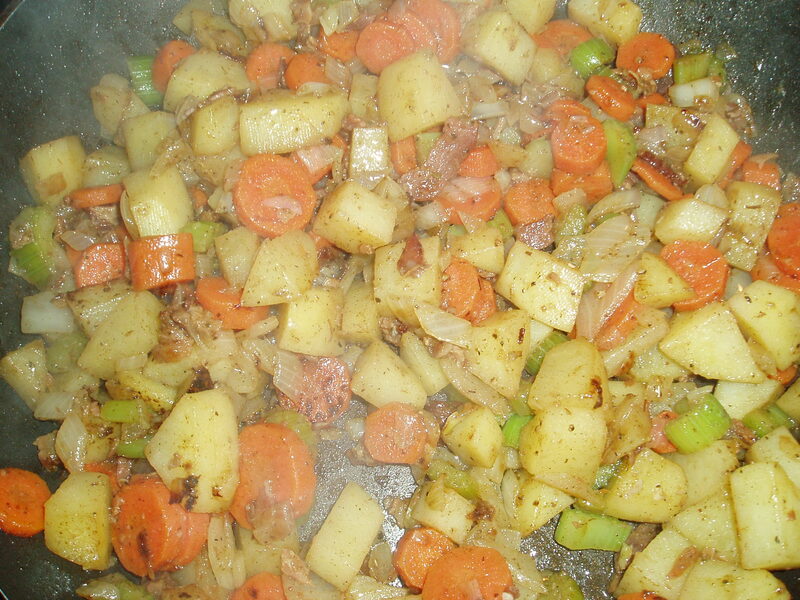 In a large skillet heat the oil and add, the bacon…if using, all the vegetables and garlic. Saute until they’re starting to get slightly golden and then add the poultry seasoning and make sure everything gets coated. Continue cooking until the vegetables are light golden brown and then add to the slow cooker. I cooked mine on high for about three hours and I think on low would be about five. This soup is great all by itself for a hearty lunch. Also good with French or Italian bread and a salad for a dinner.